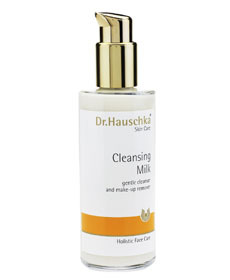 Oh well, I broke down and bought Dr. Hauschka's Cleansing Milk today. My local health food store now carries this brand, thus negating the need to travel to Berkeley. I experienced a small pain in the wallet as I bought my Milk, and wondered if an earlier casual remark--that a dollar spent on good skincare meant saving at least five dollars on everything else--held much water. And decided there was something to it. I'd run out of my usual evening facial cleanser, the (in)famous beauty-board darling, Johnson & Johnson Head to Toe Baby Wash, a while back. That's when I started using a sample of the Hauschka Cleansing Milk, and realized its odd, almost greasy whitish lotion was good for my skin. Less acne, fewer flakes, softer texture, all-around expensive skincare goodness. When I'd squeezed the last drops from the sample tube, I was left with nothing, and started washing my face with some tea-tree oil soap. Now this was not good for my skin. Makes a great hand wash, but, face-wise, I was beginning to see pimples. Pimples are depressing enough in their own right, but are particularly disturbing to those who have been to acne hell. Signs of returning to hell...eh...not good. I found the Cleansing Milk lasted for a surprisingly long time. I used it sporadically, so I can't be accurate, but three months is probably a conservative estimate, I'd guess a bottle'd last twice as much. I suppose I should preface this by saying I've never really been into skincare. Part, if not most, of my disinterest stems from having gotten adult acne at age twenty-nine. (Before I got adult acne, I had literally perfect skin, which itself made me uninterested in skincare.) As adult acne sufferers know, the finer points of skincare get lost in the shuffle as the sufferer tries everything within grasp to attain normal, reasonably clear skin. Skin conditions such as acne cannot be "cured" externally. You have to discover what triggers the condition, if not the root cause. I wasted years trying to treat my acne externally, and finally got rid of most of it through internal methods such as diet changes, vitamins, and birth control pills. Of the treatments that do work, most do not work right away. Typically you see some results, but you won't see the full results unless you stick with it for weeks, months, sometimes even years. The products that make your skin look really good right away, tend to fall into the "works at first, then stops working" category. I don't want to generalize overly much; those are just my experiences with acne. Since my skin is still acne-prone, I am going to have a conservative approach to skincare. For some time now, I've had it in mind to...exfoliate. When you have real acne, that's out of the question. But now, I don't have pimples, but I could do with some sort of a scrubby thing. Almond meal is a blend of whole ground almonds, including shell and nut. The meal mixes readily with water to form a natural emulsion that is highly absorbent of water and oil. In Cleansing Cream it absorbs oils, dirt and perspiration from the skin. The soothing, calming properties of almond make it gentle enough for even the most sensitive skin. Almond meal has been used traditionally for its cleansing and purifying effect on the skin. In ancient India and Egypt ground almonds were pressed into bars for cleansing the body. Sounds a tad scratchy, doesn't it? There's another reason I've been reluctant to try exfoliants: I've had these visions of scratchy bits of nut shell, scraping away at my face (I'd prefer to have dead skin, thanks). You are to use a "press and roll" application method for this, rather than outright scrubbing. I've used this three times now (and am planning to give it another go tonight). The almond meal particles are quite small, thank goodness. They don't scratch. Like just about all "premium"-ish products, a little goes a long way. A glob the size of a large pea is enough to cleanse your face. I didn't actually "press and roll" all that much, but then I don't have sensitive skin. Light massaging does the job for me. This smells pleasant, of faint real roses and some other natural stuff. I was a bit surprised it left the surface of my face feeling almost oily. Mind you I've been putting jojoba products on my face for years; "oily" doesn't freak me out. After I'd dried my face though, it felt not oily at all, in fact it felt somehow...not dry on the surface, but dry inside. Kinda weird but not unpleasant. It hasn't as of yet exfoliated perfectly. My skin feels smoother, less flaky, but I still detect some rough spots. My gut tells me that's actually a good thing, due to #2 above...that continued use might produce perfect results, rather than having perfect results right away. In any case, I'll update this later on. I find this takes practice to use correctly. It's best used on damp, softened skin, so after a shower is best. The press-and-roll method emulsifies the almond meal on your skin, and all that loosened up skin just lifts off. This is the gentlest, most effective exfoliating method, because it doesn't peel away anything that isn't ready to go yet. The only problem with it is that it's expensive, but it's easy to make at home. I am sooo allergic to this stuff though. Once in a while, there comes along a beauty product that actually does change your life. Most of them don't, of course, but some of them do. This has been on my mind for a while...because once such a product becomes part of your life, you tend to forget what your life was like before. Johnson & Johnson Head to Toe Baby Wash. This has been my facial cleanser for years, literally. It seems to me it was already a "board lemming" (something everyone on the beauty board has to own!) when I joined The Lipstick Page forum in 1998, and I tried it at that time. Why is this revolutionary? It is the perfect cleanser for my oily/combo, acne prone skin. It cleans without stripping (though I doubt it would work for dry skin; too astringent), removes makeup (at least the level of makeup I wear...I don't wear mascara, so I don't know if it works for that), does not irritate eyes--being baby wash--making it ideal for removing eye shadow and liner...has a light pleasant scent, is overall pleasant to use, no breakouts...and best of all, it is cheap. It comes in ginormous bottles at Costco...yes, the price has risen, but it's still a mere $10 for two huge bottles. And--if there needed to be an "and"--it's terrific for washing makeup brushes and puffs, hair brushes, I use it to wash out my haircolor bottles; any time you need a mild, yet effective, cleanser, there it is. A daily multi-vitamin. This has made a tremendous difference in my (acne prone) skin and overall well-being. Do some research...and, especially if you are of child-bearing age, consult your doctor before starting on a vitamin regimen. For acne: consider switching your birth control pill. Some are better than others. Some are horrible in fact. I've gotten the best results from Ortho Tricyclen and Yasmin. For acne: analyze your diet and check for allergies. My own acne is triggered by particular foods. If I eat a lot of beef that was raised with growth hormone, I'm sure to get blemishes and extra-oily skin. I've heard of people getting acne from allergies to foods such as tomatoes, citrus, or milk. I've heard of someone who got acne because she was allergic to parabens. Give it some thought, see what you're eating and what's in your environment. Jojoba butter/jojoba oil. The butter form is superior to the oil if you're going to use it as a night cream or moisturizer. The oil is better if you're going to mix it into something else, such as a tinted moisturizer or shampoo. This is my ideal moisturizer, and--like the J & J Head to Toe above--it is way cheap (I'm still working my way through my original jar), and the perfect thing for oily/combo, acne prone skin. I use it only at night (I don't use a moisturizer during the day)...it gets rid of flakes, makes my face feel nice and soft--not greasy...it sinks in--and, it helps keep pores clear. MAC Blot pressed powder. Worth the $18 price tag (did I just say that? ), if you have oil or shine to deal with. I didn't believe it either, until I tried it. L'Oreal Feria deep conditioner. How did I ever live without this? I started out coloring my hair with Preference and used the Preference deep conditioner before, but I like the Feria one better...and you don't need to use the Feria kits to use the conditioner. Just buy it at Sallys Beauty Supply. This is "the cure for colored hair"...just use it after coloring, for the next few days. Your hair will feel as if it had never been colored, and ladies, I bleach. No crispy, crunchy hair here. Nars the Multiple in Malibu. Not necessarily ideal as a multi-purpose product...as a lip color it's gorgeous, but imo too dry. As an eyeshadow it'll do, but I have better shadows. But oh, as a blush, it is perfect. I say this because I have been, by and large, far too lazy to put on blush. This cool stick form means I can grab it after I put on my tinted sunscreen, dab it once or twice on each cheek, blend with my fingers, voila! Done! Painless! Moreover, this somewhat bronzy, neutral rose color (if anything, it is ever so slightly warm) is perfect year round, because of the bronze. As my skin gets paler, this stuff looks more bronze...it morphs into something of a bronzer. In summer the bronze fades into my tan and I'm left with a lovely rose blush. Nars Babylon duo eyeshadow. I still love this duo; it's foolproof. Okay, you have to be able to wear orange eyeshadow. If your coloring is cool, I don't think it would work. But for neutral-to-warm coloring, and green eyes...it would work for any eye color, but it's stupendous with green or blue...you've gotta have it. I am of the opinion that there is a Nars eyeshadow duo for everyone. Babylon is mine but there are many more to choose from. Christian Dior Beige Massaï eyeshadow quint. This is the "subtle" version of Babylon; again it is ideal for green or blue eyes and neutral to warmer coloring. Instead of the shimmery tangerine of Babylon, you get a soft cantaloupe shade, along with a surprisingly useful creamy light shade (makes a divine wash), a neat shimmery terracotta shade (looks great with the creamy shade) and a couple of browns (look great with the cantaloupe shade). Likewise, I feel there is a Dior eyeshadow quint for everyone. These are $ so pick carefully, but you will get a lot of mileage out of it. MAC Permaplum Powerpoint eyepencil. By far my favorite eyeliner, both the color...it's a deep, slightly blue-toned purple, with a smidge of (largely invisible) pink shimmer...and the formula, which neither smears nor fades (in fact it's a bit difficult to remove, be forewarned), holds a point perfectly, sharpens without crumbling (at least not yet, and I've owned mine for about two years), it hasn't turned hard yet, still goes on silky smooth... The color is quite versatile. MAC Lustre formula lipsticks. These are great, especially if you've been avoiding lipstick because most lipsticks look unnatural on you. The Lustres are sheer (the sheerness varies from shade to shade) and come in a range of wearable shades. Plus, MAC lipsticks taste faintly and pleasantly of vanilla, and you can do a Back to MAC (see Back to MAC and Back to MAC expanded for MAC freestanding stores). Plus, these wear quite well for being sheer and shiny. Chanel Hydrabase lipstick in Moiré. I dream about this lipstick. I do. I have a sample size of it; it's addictive. Note: some people hate the scent of this lipstick. I happen to love it, but, well, it's likely to be either love or hate, so you might want to try it before buying it. This has a rather strong, candied rose fragrance, which only makes it more addictive to me. The coverage is interestingly "medium" rather than "full" or "sheer." It really is medium. You get quite a bit of color, yet it's more forgiving than a full coverage lipstick. Moiré is many colors in one. It goes with everything and always looks right, from business/office/meeting to casual to festive. It's almost YLBB (Your Lips But Better) but it's more color than that...it's got brick red, plum, rose, a neat little twist of fuchsia shimmer (as the shade name implies)...it's on the warm side. If lipsticks easily turn orange on you, it may not do. It's nice and moisturizing, lasts well on...no smearing or bleeding...feels light as a feather. Oh I'm sure I'll think of something else right after I publish this. What passed through my mind, was how awful it was for me before...the acne itself is not nearly as bad as not knowing what triggers it, or what to do to get rid of it. You feel as if you're always walking on eggshells. You don't know why some days are good and then the acne comes back, which it always does. You spend a lot of time and money on surface treatments, which in my own experience either don't work at all, or else work at first and then stop working, or else do work, but destroy your skin in the process. Those days are long gone for me; I know what triggered the bad skin day. Simple. I was on my placebo week of Yasmin birth control pills and I was eating regular, i.e. growth-hormone-raised, beef, several times. I should have been more careful, since it was the placebo week; I shouldn't have eaten the beef that much. To clear it up simply means not eating beef for a few days, drinking white tea or water, and piling Differin directly on the blemishes (don't get it on the surrounding skin). That's what I've been doing, and the blemishes are nearly gone, with no new blemishes. (The sooner you put the Differin on, the better. The first day or so, you can put it on twice. Once it starts working, just do it once per day.) If I wanted to clear the skin more quickly, I would just drink more water or white tea. But the simple idea of avoiding hormone-processed beef, and shrinking the existing zits with Differin...works like a charm. On a side note, my skin also felt oilier during the bad skin day. It feels much drier now. On another side note, I have no affiliation with Differin. In fact it was horrible as an all-over acne treatment. It made my skin so flaky, it was scaly. It was worse than having acne...I mean literally...I dropped it and went back to having acne back when Differin was what I was supposed to be using. But as a spot treatment...applied only on the zits...it's brilliant.